Different ways of configuring Hive metastore Apache Hive is a client side library providing a table like abstraction on top of the data in HDFS for data processing. Hive jobs are converted into a MR plan which is then submitted to the Hadoop cluster for execution. The Hive table definitions and mapping to the data are stored in a metastore. 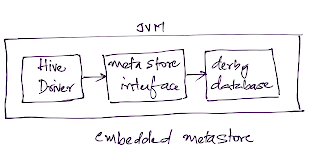 Metastore constitutes of (1) the meta store service and (2) the database. The metastore service provides the interface to the Hive and the database stores the data definitions, mappings to the data and others.